A feeling of anxiety in the face of imminent danger focuses the mind into reacting appropriately. The anxiety normally recedes soon after the event, but in some people, this emotional response can be exaggerated and become chronic. The causes of anxiety often involve a range of psychological, genetic, and environmental factors. As well as a constant sense of fear and worry, many anxiety sufferers can experience anxiety episodes, or attacks. This is when the person feels an unforeseen onset of extreme panic, and symptoms can often mimic a heart attack or breathing problems, which can be frightening. Symptoms include an irregular heartbeat, chest pains, and the need to escape. 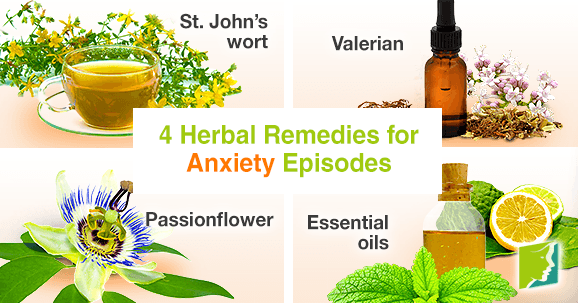 Some herbal remedies can help relieve anxiety, and thus the frequency and intensity of attacks; a few are listed below. This herbal remedy is often used for the treatment of low mood and provides relief from the side effects associated with insomnia. It can improve mood and sleep quality. This plant is a popular medicinal herb and contains the unique phytocompounds valerenic acid and valeranon, which have a calming effect. This means that this herb is particularly effective in treating stress and anxiety. It's often used as a sedative to help sleep occur naturally, and can reduce anxiety. However, valerian can't be taken for more than a few weeks at a time, or at the same time as any prescription sedatives. Some studies have shown that passionflower works as well as some prescription medications in relieving anxiety. However, the research is sparse, although some people claim it helps them. As with valerian, this herbal supplement must not be taken with any sedatives. The aromas of lemon balm, bergamot, and jasmine are calming, and therefore can help the body relieve stress and anxiety. They can be used in a bath or dabbed on a cotton ball to be gently breathed in. All herbal remedies must be used with care and after talking to a doctor. As with any food, some people can react badly to certain herbs, so if you notice any problems occurring as a result of herbal medication, stop immediately. That being said, many herbal supplements are safe for most people, and, when used appropriately and carefully, are a way of relieving anxiety without the risks and side effects that commonly come with conventional anxiety medications.